carol j. phipps | all galleries >> Galleries >> Spring_Scavenger_Hunt_2010 > #15 Surprise! Came home to a surprise ~ new Storm Door. Jenny Gray and I are happy and surprised, in the best way, with the new storm door! The extra sunlight is wonderful! Looks like your cat approves. Nice shots of this sun worshiper. Nice scene and sure they like the new view! Wow, did it magically appear? I need a storm door....I miss having the front door open. Love the triptych! A nice surprise and a wonderful series. 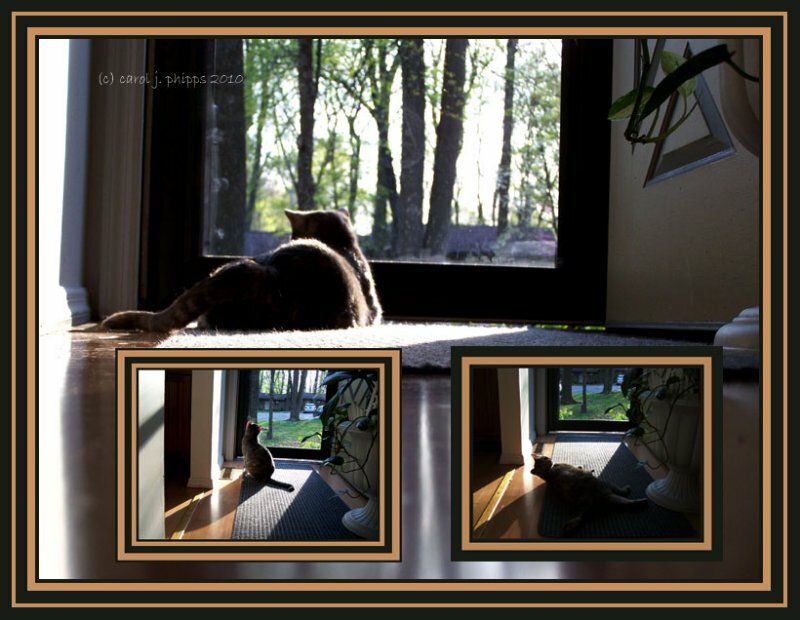 Great series, the cat will love the sunlight, she seems to have chosen her favourite spot already. Kitty needs to have a nice view of the outside! Nice one, Carol! Wonderful series and presentation Carol! Your cat is really revelling in it! Great triptych. Welldone. More sunshine for the kitty! How nice to see the light of the world through this door, warm and lovely scene. V.